Anyone that knows me, knows I love cheese.... A coworker and I were talking yesterday about grocery shopping on a budget and she said that she didn't think she could grocery shop on a budget because she is a cheese connisuier. She is always buying specialty cheeses which depending on the kinds of course, could be rather expensive. I "think" I might be a cheese connisuier too. I have never met a cheese that I didn't like. Well maybe just one: bleu cheese and it's not that I don't like it but rather I prefer not to eat it. If it was the last cheese on earth I would probably eat it though. There is just something about "moldy" cheese that I just don't care for. Which is kinda funny when you think about it because what is cheese? In general terms, cheese is curdled, fermented milk. 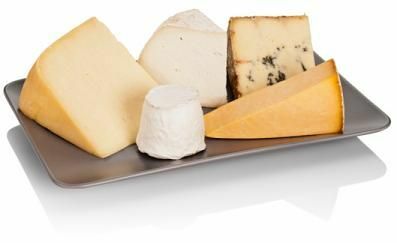 Fun Trivia: Did you know that there are 670+ types of cheese in the world? How many cheeses can you name? How many different kinds have you tried? What is your favorite?